When a bronze gong is struck in the middle of an art gallery, does it make a sound? Well, according to Catalan artist Jaume Plensa, that might depend on you. The solemn clang of his well known work Jerusalem is not so much an aural phenomenon as a vibration of the heart. There are 11 gongs in a darkened room, waiting for a visitor to become number 12. They are suspended next to malletas and inscribed with text from the Biblical Song of Songs. One might also ask if the sound of the ancient instrument is the reason one strikes it, and not vice versa. Plensa seems keen on poetic logic. “I have said many times that for me sculpture is the best way to pose a question – that is, the most conceptual way,” says the softly spoken artist. His serious mood is amplified by the ten monumental alabaster heads in the gallery where I speak to him. They radiate solemnity. 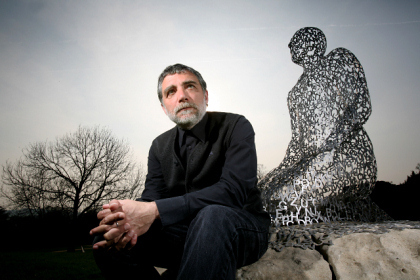 “But on other levels sculpture has a tremendous capacity to talk about abstraction,” Plensa continues. He says it is so difficult to create portraits with sculpture that sculptural gestures are more conceptual than concrete. So like any decent gong, sculpture depends on what the viewer brings to the party. There go the laws of objectivity again. In Plensa’s hands reason is as soft as alabaster and as malleable as one of the many lines of poetry he gives three-dimensional form to in this show. Given the ancient appeal of these deity-like Alabaster Heads, it comes as a surprise to learn that here, as elsewhere in his work, computer modelling has been used to elongate the forms. And when I ask about the extensive use of technology in his work, the answer is also unexpected. Plensa mentions a recent visit to York Cathedral as an example of a previous form of hi-tech, and mentions the standing stones at Carnac in Britanny as an example of applied repetition. Rhythm in sculpture does for the brain what in music it does for the body. “It helps you to concentrate,” he says. It should be pointed out that many other works by this sculptor have contemporary written all over them. In adjacent galleries are luminous fibreglass creations: In the Midst of Dreams and Hear No Evil, Speak No Evil, See No Evil. Outdoors are more virtually dreamed up sculptures comprised of grids and alphabets, including the eight-metre high figure House of Knowledge. Perhaps there’s even an echo of Faulkner’s novel, Wild Palms, in the 58-metre sculpture Twenty-Nine Palms. This showstopper is made from 17,000 stainless steel letters which spell lines from a range of the artist’s favourite authors. Plensa trails a hand across the curtain to demonstrate the jangle. Written for Culture24. Jaume Plensa was interviewed at Yorkshire Sculpture Park, Wakefield, where his show runs until 25 September 2011. See gallery website for further details. Thought you might not have seen Our Vintage by Hemingway retro type prints? Thank you Helen, I suppose his Random Letters look a little bit a Jaume Plensa sculpture, but otherwise the connection to this post is a bit tenuous!